Malaga, a mid-sized city in Spain's southern Andalusia region, offers a just-right combination of culture and beach—plus, it's the perfect starting point to explore southern Spain. The city's major airport and convenient bus and train stations make traveling around Andalusia as simple as checking the times, booking the tickets, and starting on your Spanish adventure. Renting a car is also a good option and in many cases the best way to make a quick trip to these towns. You can take organized tours to Morocco, Seville, and Granada, and there is a direct train to Osuna, where HBO's Game of Thrones seasons five and six was filmed. A day trip from Malaga to Morocco is virtually impossible if you are traveling without a group and guide. But Morocco warrants a longer stay than a day, and you could certainly plan that by yourself (the country is a lot more tourist-friendly than it used to be). Getting a direct flight to Morocco from Malaga is not an option. Granada's proximity to Malaga makes it a perfect day trip from the city. It's about an hour-and-a-half drive, and it is easy to reach Granada from Malaga by bus (there are no trains), or you could take a guided tour or rent a car and drive yourself. Granada welcomes tourists, so you could easily visit Granada independently, without a tour. But one big advantage of a guided tour is the visit to the Alhambra. It's always included on a guided tour and is the high point of the trip. If you are not on a tour, you will most likely have to wait in a long line to get in, and the tour lets you jump the line. Nerja, a bit less than an hour's drive from Malaga, is a popular beach town on the Costa del Sol, but its caves set it apart from the other coastal towns of Andalusia. The caves stretch for about three miles and contain the world's largest stalagmite, which is nearly 105 feet tall. The caves of Nerja are one of the most visited sites in Spain. Its beachfront promenade sits high on a promontory and affords spectacular views of the Mediterranean and the surrounding Sierra Almijara, Tejeda, and Almira Mountains. Ronda is ​about a 1.5-hour drive from Malaga, is a little off the beaten path, making a guided tour an especially good option. Ronda is the birthplace of bullfighting and has a great winemaking tradition, but it's most famous for the centuries-old bridges over the Tajo Gorge. It's also got those iconic whitewashed Andalusian houses, a hallmark of southern Spain. Ronda is small and easy to get around by yourself. If you have a car, the drive to Ronda is interesting, particularly if you drive via Marbella. The bus and the train both take just under two hours each way. That's a lot of travel time in one day and requires making sure you get your logistics just right. With four hours in one day taken up by travel, you want to make sure you get the earliest bus or train you can. A guided tour is also probably a little quicker, as is driving yourself. Seville is the most popular city in the south of Spain, but it takes about two hours to get there from Malaga, and that makes it a very long day trip. It's really best to make it at least an overnight trip from Malaga because of the distance. If you are attempting to do it in a day, a guided tour is your best bet. You can get there on the train in about two hours or on the bus in about three. Driving would also take about two hours. One of the most beautiful cities in Europe, let alone Spain, Seville is a vibrant magnet for flamenco, bullfighting, tapas, and renowned architecture. If you are not taking a tour, find a walking tour to really get a good glimpse of the city along with some commentary about what you're seeing. Jerez de la Frontera is most famous for being the birthplace of sherry. It is also well known for its horse shows. If you can stay the night, Jerez is also good for flamenco and, yes, tapas. As is true across Spain, this is a late-night activity. Stroll through old Jerez along its cobblestone streets and take in its Baroque churches and typical Spanish plazas. Getting to Jerez by train takes about four hours, and that makes it impossible to visit for just a day unless you drive yourself, which still takes about 2.5 hours. Unless you really are squeezing it into your itinerary, it is best to stay overnight. The world's been talking about Osuna since "Game of Thrones" was filmed there. Keep an eye out for the old university and bullring, which played the parts of Dorne and Mereen. The "Thrones" connection is its main attraction, so if you're not a fan, this is a candidate for skipping. You can get to Osuna from Malaga on the train in about two hours or you can drive, which is a bit quicker; you can get there in your car in about 1.5 hours. 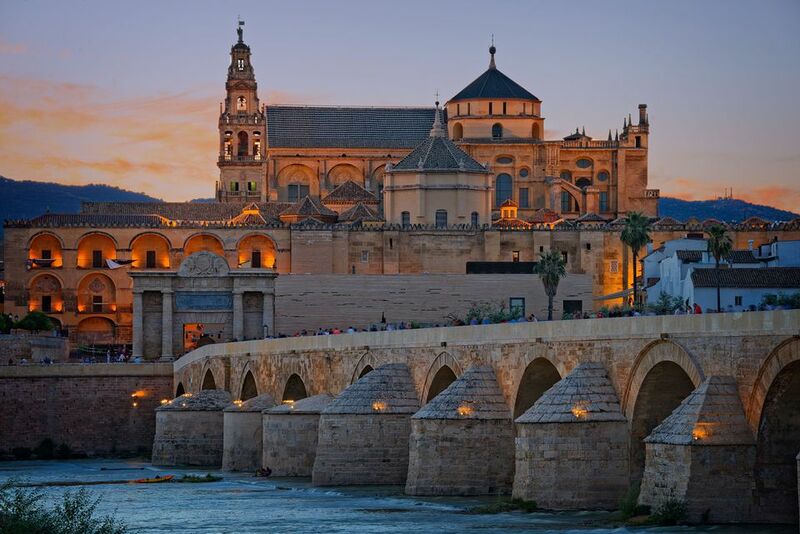 Cordoba is the third most popular city to visit in Andalusia, after Seville and Granada—and definitely a distant third at that, but its beachy old town and one of the world's most important historical mosques makes it an important stop for visitors. It's full of whitewashed houses and buildings amid patio gardens bursting with blooms, a quintessential postcard of Andalusia. Islamic, Jewish, and Christian cultures all merged here to form a true Spanish experience. You can drive to Cordoba from Malaga in about two hours, and that's pushing it for a day trip since there is so much to see here. Taking the train, which zooms across the distance, takes less than an hour and is the best option. Visit Gibraltar, the last colony in Europe (it belongs to the United Kingdom) and home to some famous monkeys. You can take dolphin- or whale-watching tours, too, and don't miss a trip up to the top of the Rock of Gibraltar, where you will get a spectacular view of Africa. The best way to get to Gibraltar from Malaga is by bus. It takes about three hours and deposits you right at the border of Spain and Gibraltar, and then you walk across the border. Pretty cool. If you want to experience what medieval Spain was like, Antequera is just what you're looking for. It's less than 30 miles from Malaga and a perfect day trip. Its architecture reflects its Roman, Moorish, and Baroque Spanish heritage. You can get there from Malaga via the bus, which makes several trips every day, as does the high-speed train. Both take less than an hour. If you're driving, it's about a half-hour away from Malaga. Andalusia is most famous for its whitewashed villages, with these iconic houses in sparkling white with red-tiled roofs marching up and down the twisting, narrow streets of many of the towns. They form a perfect canvas for the cascading blooms all along the street and on the patios. Frigiliana is one of the best examples of a typical whitewashed town, and it is an easy hour's drive from Malaga. You can also get to Frigiliana on the bus but you must go through Nerja to do that. The whole trip takes about an hour and 15 minutes. If you want glam, Marbella is the place you want to be. It has nightlife, spectacular golf, stunning beaches, and upscale shopping. And if you want some history with your luxury, walk around the Marbella's Moorish Old Town, where you'll find interesting boutiques and charming restaurants around the Plaza de los Naranjos. If you're driving, it takes about 50 minutes from Malaga. If you're taking public transportation, you can catch a bus to Marbella at the Malaga Airport about every half hour, and it takes about 40 minutes to get there.